After a strong and successful season 4 launch, the Shopkins Season 5 Release Date has come and the Shopkins Season 5 are better than ever. 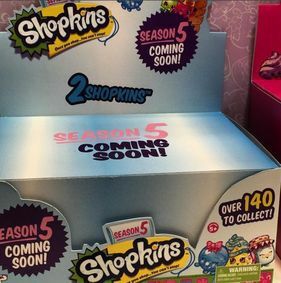 The season 5 Shopkins came out in May 2016. Some people in Canada reported some early sightings and some of the packs are being sold on Ebay. 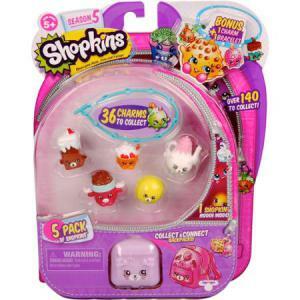 Rather than the normal Baskets, the Shopkins have Petkin Backpacks as the blind bags. These Backpacks are able to be connected together. There are also be 36 charm bracelets available to collect. There are also some awesome sets coming like the Style Me Wardrobe set which will contain shelves and drawers, a rotating mirror and display to show off your favorite Shopkins. Reports keep pouring in about the success and popularity of Shopkins and the growth of the Shopkins brand. The momentum of Shopkins shows no signs of slowing down and there is likely exciting news ahead. Make sure to check out and “like” our facebook page where we will be have up to the minute news as it is released. It is also the place for the best Shopkins Crafts and a community of other Shopkins fans. Check out the Season 4 list to make sure you have them all.